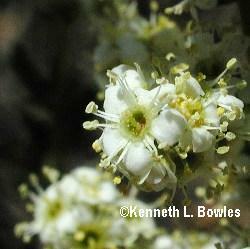 A member of the rose family, Adenostoma bursts into bloom in the spring with heavy clusters of tiny white flowers at the branch tips. This multi-stemmed shrub is loosely branched and is best suited for a less formal garden design. It is adaptable to any well draining soil and will tolerate temperatures of 0 degrees F. this tough shrub would make a dramatic planting for a rugged slope, or along a fence or wall. This is a major component of native chaparral where it both controls erosion and protect the soil after fires. Indigenous peoples used the branches for arrow shafts.